Dentistry is a science and an art. I take pride in creating a beautiful smile that combines my high aesthetic standards with the most up-to-the-minute dental technology. I truly believe that top-notch care, delivered in a warm, personalized environment, is what makes the difference between good and great. My team and I have been together for almost 25 years, and when you walk into our office, you will see why. I take pride in being able to fuse the clinical with the personal. By doing so, I’ve been able to achieve superior clinical results along with long-lasting patient relationships. I was born and raised in Miami. I graduated from the University of Florida in 1974, and attended Tufts University School of Dental Medicine in Boston, where I finished in 1977. 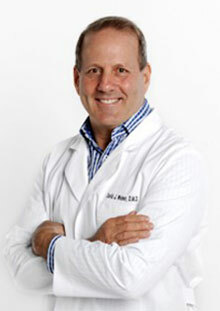 After graduation, I returned to Miami and started my dental practice on S.W. 8th street, where I met individuals who are still my patients today. 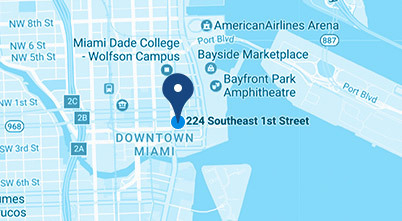 In 1984, I opened my doors on Brickell Avenue, and moved to Downtown in 1991. I have just finished construction on what I feel is my crowning achievement, my state-of-the-art dental facility at 224 S.E. 1st Street, in the heart of Downtown Miami. I am a member of the American Dental Association, the Florida Dental Association, and the South Florida Dental Association. I feel the most effective way to stay abreast of the latest advances in dentistry is to attend the annual meetings of the various dental associations, including the ADA, the Hinman Dental Society in Atlanta, and the Greater New York Dental Meeting conferences. I continually upgrade my knowledge by attending postgraduate continuing education courses in cosmetic, restorative, implant, and sedation dentistry. In my spare time, I enjoy boating, tending to my vegetable garden and fruit trees, and spending time with my family. I am active in the community, most recently by raising money for Walking 4 Friendship and Friendship Circle Miami, a volunteer organization that serves children with special needs, where my daughters have been volunteers for the past eight years.